Live time, current date or dynamic countdown designed and created by PresentationLoad. PresentationLoad makes the dynamic illustration of time, date or countdown in PowerPoint with the revolutionary "Dynamic Time Add-In" possible. 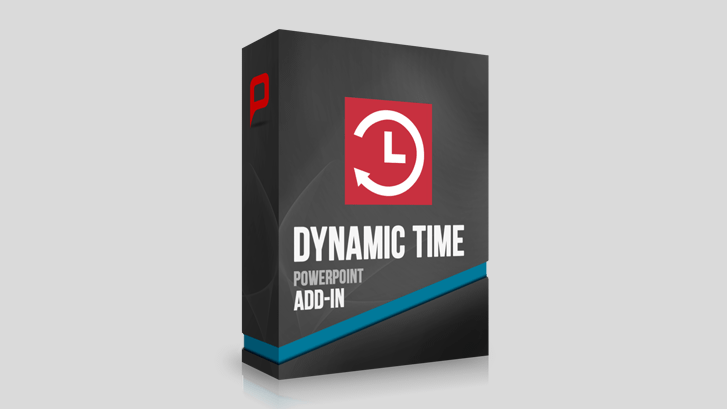 The “Dynamic Time Add-In” is a new tool developed by PresentationLoad to display the time and date of your presentation or any other time setting you prefer. The dynamic time illustration was created to be adjustable to any professional requirements. Deadlines, time limits, important appointments, opening dates for new locations or the publication date of your next product: show time and time periods as vivid, realistic and aesthetic as never before. This add-in offers you four solutions at once for your next presentation, slideshow, info screen or convention presentation: choose either from the modus time, date, counter or countdown to modify the Dynamic Time Add-In. Thanks to an intuitive user interface, you can easily configure the add-in and adjust all settings without any experience in programming. For a quick start we have created 40 slideshow examples for you. Each slide and its elements can be edited in size, shape, font and color according to your professional requirements. The fonts that have been used for the design slides are already included in the set.